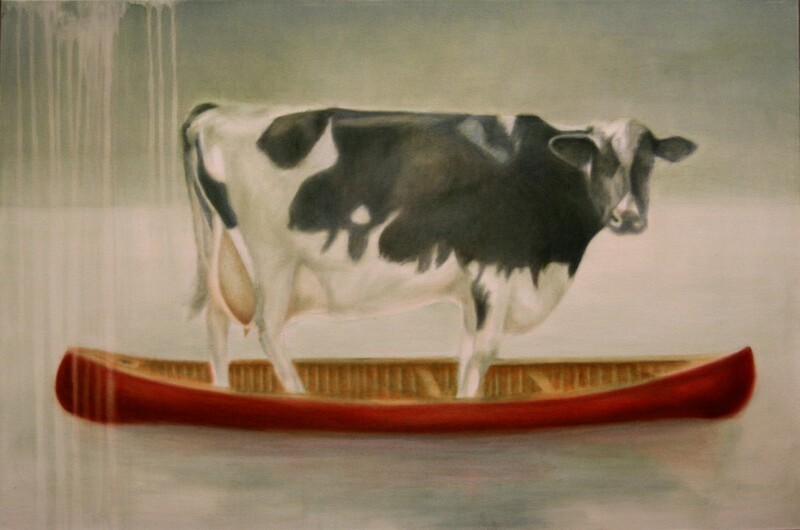 “Spilt Milk:: What’s In Your Canoe?” ©2010 Janice Tanton. When I was a child, I had a beautiful book of nursery rhymes and poems that my Mom and Dad would read to me. I still have the book, and I’ve read it to all of my children. Wynken, Blynken and Nod by Eugene Field was one of my favourites. This rich poetic notion that inspired me to dream beautiful dreams and that sailing off in wooden shoes was possible. To let the curtains fade. I am just one Mom, looking for the answers to what looks like a bad mess, the boots lying around, the proverbial squeaking door. In the same way I’d ask my children who spilt the milk on the kitchen floor…and they all answer: “NOT ME”…sometimes it takes a bit of digging to find out the true identity of Mr. Nobody. So….just who IS accountable for the mess? Last Monday morning (Sept.10th) I met with officials from the CRPS Board to discuss my concerns with education, funding an accountability, looking for the pieces of the puzzle. What I got (I think) was a good snapshot of the financial picture this particular school board faces…but I still don’t think I know who Mr. Nobody is. It might be a lot of governing bodies who should be accountable for our tax dollars, decisions and allocations – everyone has made a little bit of a mess, resulting in an unclean house. Here’s the story from the administration at the CRPS school board, with thanks for their cooperation and willingness to explain this to me. And please bear with me here…this post is long, and there’s a lot of stuff in it. I’d like to draw it out in a picture for you – much easier to understand, but I’m rather busy at the moment in a production residency. 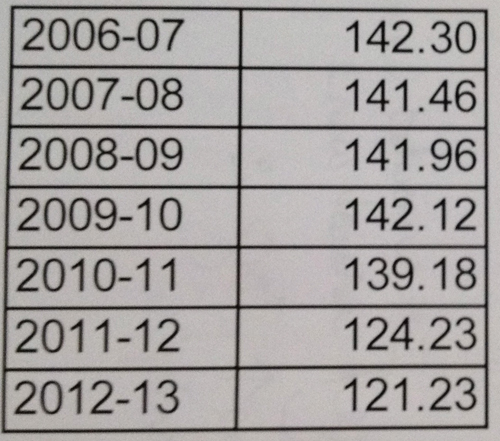 In 4 years, the province has not increased the funding to special needs education, even though all costs are going up. 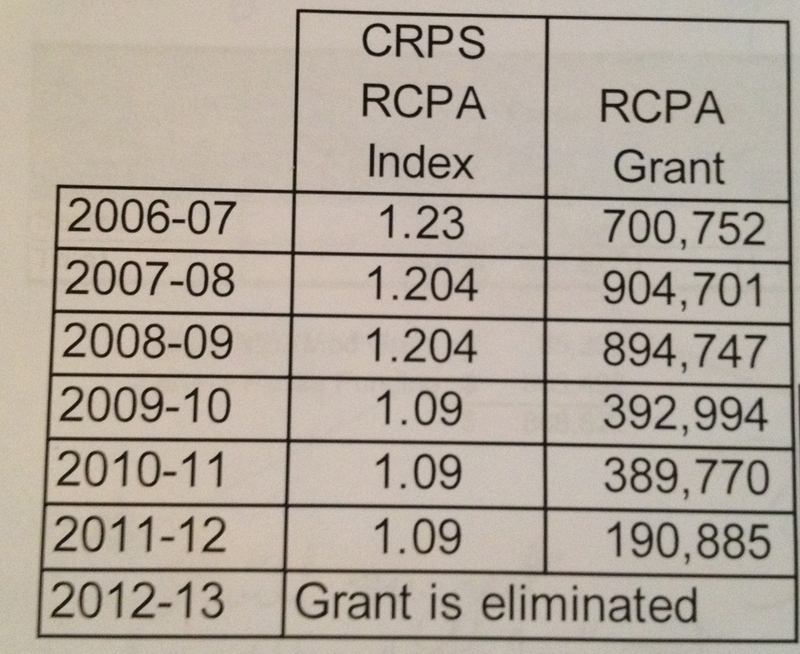 Funding received from the province at CRPS for special needs students is $888,822 but the expenses are $2,046,882. The Board has to come up with the difference. Apparently the Province will suggest that from the “regular” pot of funding, Special Education should also be propped up. However, there are no real guidelines as to how this is to be accomplished, which seems to be a chafing point. Grant funding from the provincial government is linked to enrolment. In CRPS, enrolment has dropped. 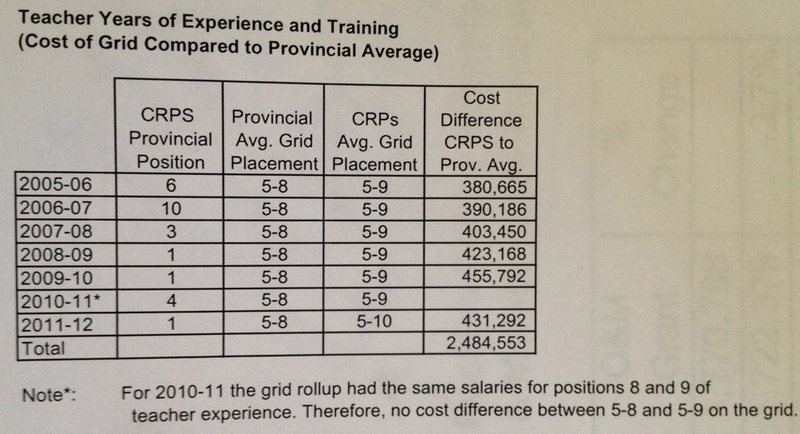 “CRPS has been in the top ten in teacher costs due to teachers being high on the grid based on experience for the last 8 years and have been #1 for three of the last four years.” Basically? No one wants to leave. Canmore and Banff are beautiful, affluent places…but filled with polarities, much like pre-revolutionary France. 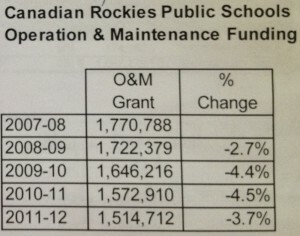 Basic Fact – Grant funding from the province drops, costs rise – you cut teaching positions and therefore “programming”. 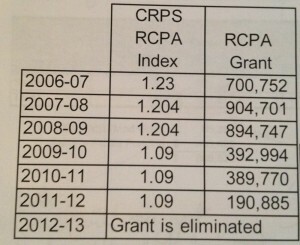 CRPS has lost 21.07 teachers since 2006/07. That almost seems like a whole school full of teachers and programs to me. Interestingly though, when you look at how many students the system has lost since the same year (267)….hmmm….it makes you wonder. And that leads me to facilities….and there’s lots of them. Brand spanking new, shiny, loaded to the gills, and yet….rooms need to be closed and they still need to be maintained. Heck…not long ago, LGMS had a huge remake to it. There’s a whack of property value on the balance sheet too. I’m beginning to see Versailles and Marie Antoinette in all of this. Are you? We’ve got some shiny buildings….who cares if we can actually provide programming or not. At one time, the Province recognized that places such as Ft. McMurray and Canmore had higher costs of living and they compensated for that through the Relative Cost of Purchasing Funding grant. 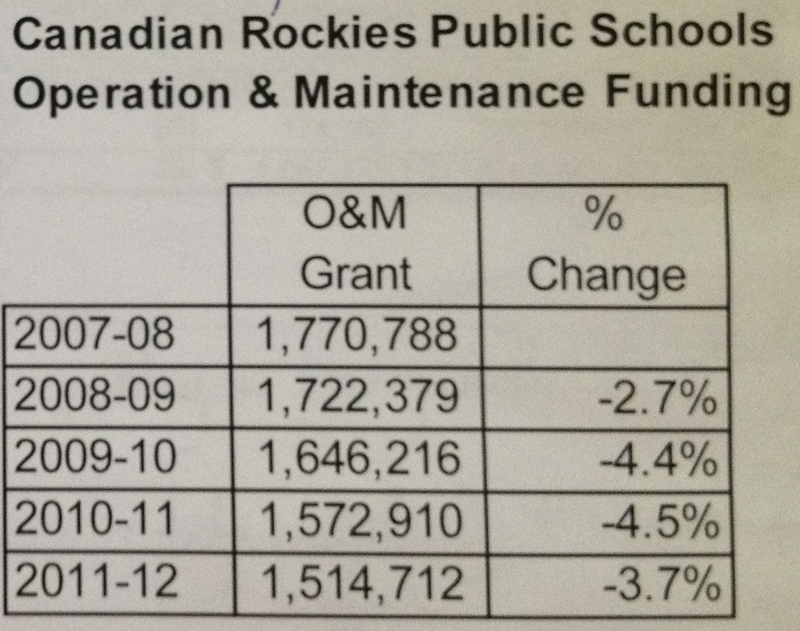 Over 6 years, that funding has been completely eroded – a drop of $700k+ in six years. YOO HOO……Premier Redford and the Ruling Elite PC Party….Ahem……it’s still not any cheaper to live here. In fact, with inflation, there’s a bigger gap for the average family, and I’m sure…the average (or not so average) school. Sheesh. I see some spilt milk on that one. Those are just a few things to chew on where the financing of our education is concerned. It still doesn’t even touch on issues such as large class sizes that I’m seeing. The other thing that is just really bothering me is that apparently CRPS has contracted our former superintendent to go out and search for overseas students. Now, that costs money. I’m not really “down” for that at all. Seems like an unsustainable pipe dream to me, and the precarious building of a very strange elitist, capitalist system of public education, where we cannot provide for our own. Speaking of strange, as we continue to build Versailles-In-The-Mountaint….our Town is looking at spending 1.8 million dollars on refurbishing the old library and gallery into an “arts” centre. I’m just not certain as to how sustainable this all is in the long run. Our kids can’t really get what they need. If we are going to continue to talk about Alberta as a leader, an innovator, a sustainable economy, it’s time to wake up and share the cake….or bring out the guillotine. I want to thank the administration at the CRPS, our principal at Canmore Collegiate and several of the trustees who have put up with my tireless questions on funding and priorities. I’m still not sure what everyone is totally accountable for and I think we need to look closely at how all the decisions are being made. A big thanks to Principal Glen Nelson and Shannon Amey for stepping up to the plate and offering to get a Grade 10/11/12 art class going at noon hours. I visited the art class for the first time yesterday and I’m spurred on by the enthusiasm and hope in these fine students. I look forward to watching them learn and grow over the next year. I don’t think it’s a long-term solution, but it sure has made a difference for some kids in our system – including Ben. Where there is a will, there is a way. How’s Alberta feeding the world up there in Edmonton/Versailles, Ron? Cake? Breadcrusts? Oil? As for our fiddling MLA Ron Casey (also former Mayor and Builder of Versailles/Canmore)…I think he’s trying to play games to be quite honest with you. He met with the school administration back in June and received all this information I have here, but really…what has he done? He’s KNOWN all this stuff all along! Pffawww. There goes my faith in politicians…again. I sent him two emails – September 4 and September 7 and I am very sure that others have as well on this topic. He’s left me a phone message on my cell phone late last week to say that he has no record of phone calls. Well of course not – I emailed…and your assistant wrote back to say she was going to discuss the matter with him and get back to me. He would have known this, as he called my cell number which is at the bottom of the emails. I pointed this out to him again in an email on September 13th, the day he left the phone message. I’ve asked him to write a response instead. Still no answer 7 days later. Nothing I detest more than a cake-eating politician. He has, however…taken to “following” me on Twitter which was QUITE amusing to me. What do I want? I want everyone to get together and fix this! Not “strategize on how to fix it”. Not “think about how to fix it”. FIX IT! Please!………I’ve got art to make, a family to feed and an art class to teach. P.S. – One more thing. Check out your tax bill if you live in Canmore/Banff. I believe a very sizeable chunk of what you pay in taxes goes to the provincial government for EDUCATION. Good questions to ask – how MUCH of that actually comes back into our public education system? Hot New Major Works By Janice Tanton At Effusion Art Gallery! On the Easel – The First Red Canoes of 2011!